Anyone can push boundaries especially when it comes to cooking and creating recipes. It’s really not that hard to take a Burger and “dress it up” by dipping it into some weird sauce or layering it with 74 different random items. That’s just like reaching into the Lego bucket and building something with whatever you grab. Pouring that bucket onto the floor, analyzing the available bricks and coming up with a plan to build a 4 turret castle complete with moat, portcullis and a stable for the ponies, well that takes an understanding of the medium, planning and the ability to create. The latter of the 2 Lego builders is how I would describe Chef’s Keizo Shimamoto and Jeffrey Maslanka. 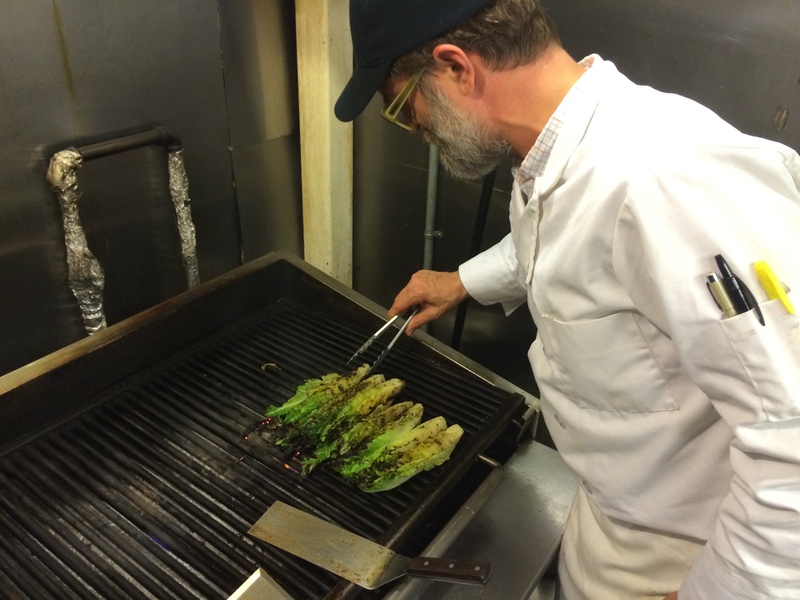 Jeff, the Chef and founder of Black Shack on Lexington has a simple yet tasty menu of Burgers on his menu including Burgers that have Garlic Creamed Spinach, Handmade Mozzarella, Horseradish Sauce as well as all the regular fixins. One of the most popular items though is the Black Shack Western Burger made with Crispy Onions, Pickles & BBQ Sauce. 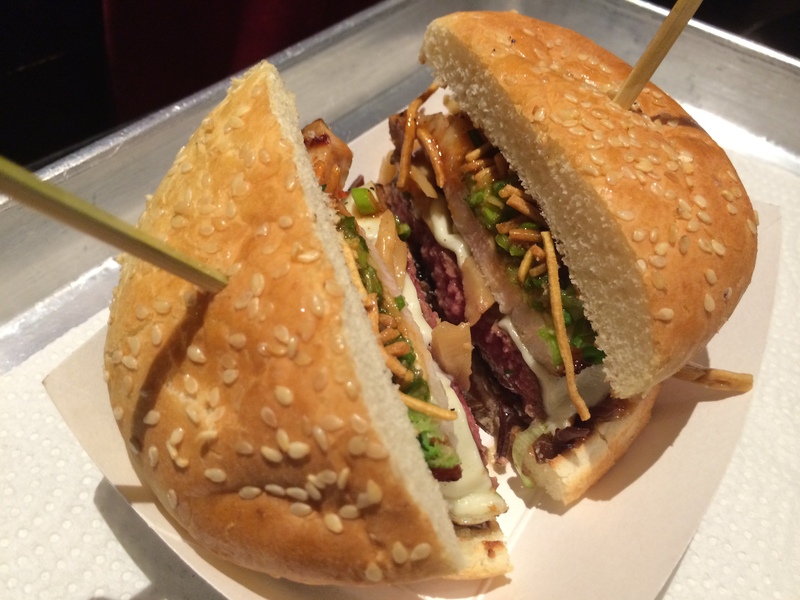 It was this Burger that helped to inspire a NY Burger Week event. 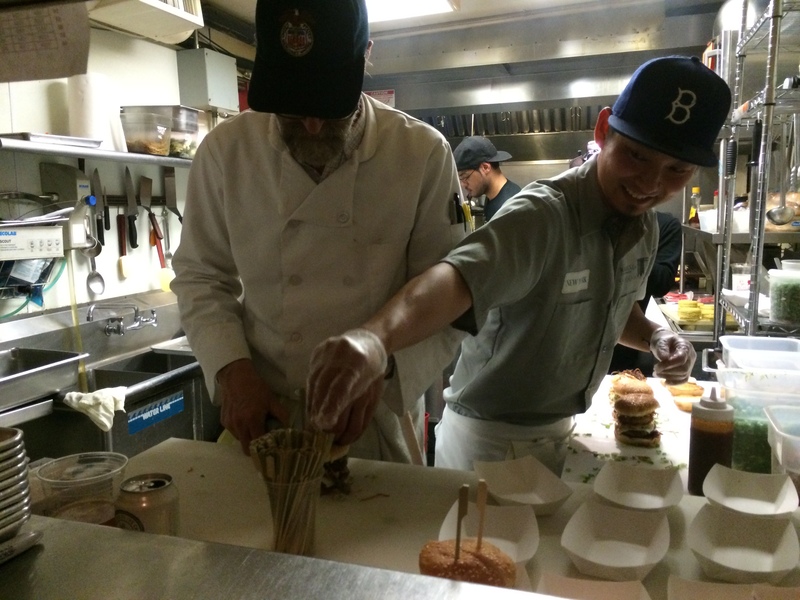 I was talking to Keizo Shimamoto, Ramen whiz kid and creator of the Food sensation, the Ramen Burger, about working together for Burger Week. 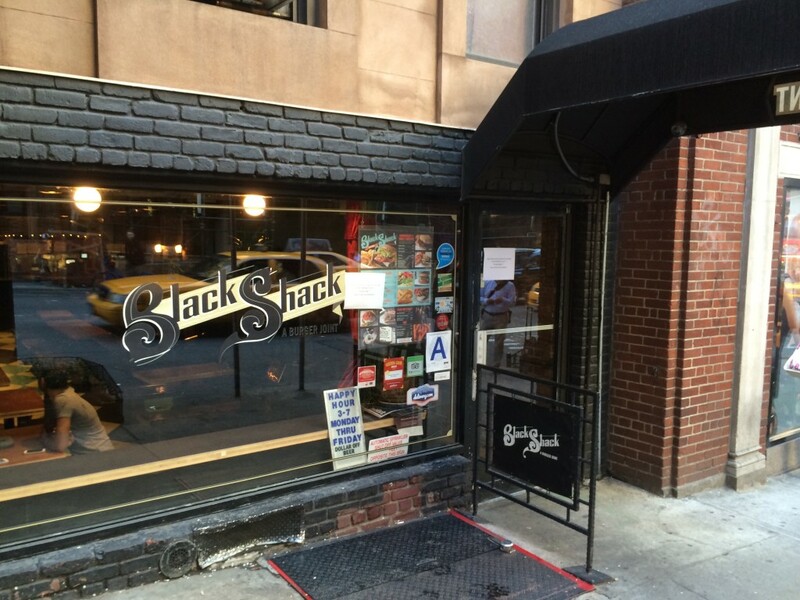 In that conversation he mentioned that one of his favorite Burgers in NYC was The Black Shack. That’s when the Burger light bulb went off. When I tell you that these guys busted their tailbones re-creating each other’s Burgers, I’m not exaggerating in the least bit. The two of them granted me a first row seat to the process. I was kept on copy for nearly every single email and text message between Jeff and Keizo as they went back and forth with ideas, recipes, photos and requests. 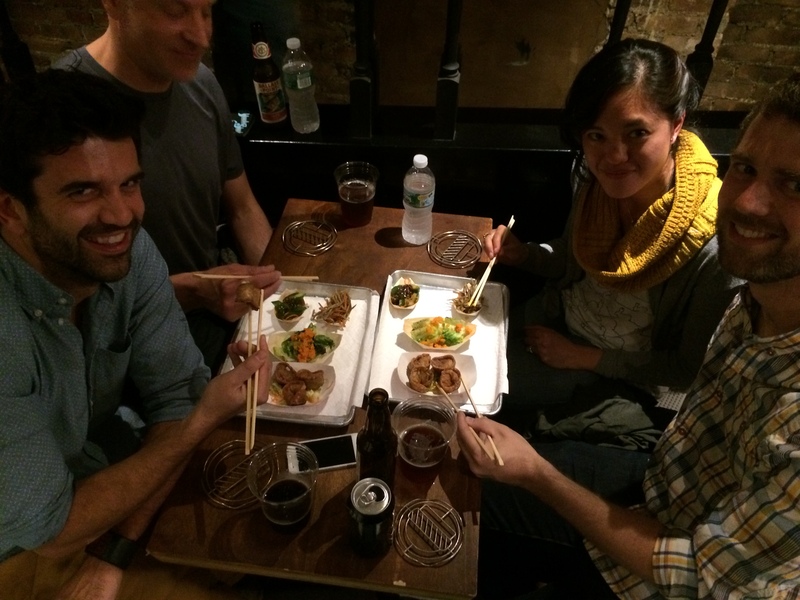 They even invited me and Brad from BurgerWeekly to come taste test the Burgers. It was an amazing process to watch and be a part of. It was no surprise then on the day of when it was time to devour the meal that it was amazing. 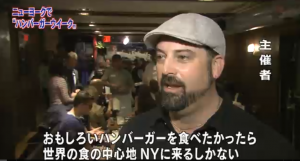 That word gets thrown around a lot but if you asked any of the 40 people in attendance, including the crew from national Japanese television channel, NHK, they would agree. The Sloppy Joe-za appetizer, an Asian inspired Gyoza stuffed with, you guessed it, Sloppy Joe was absolutely incredible as were the other apps served especially the Kinpira Gobo created by Keizo’s wife Junko. 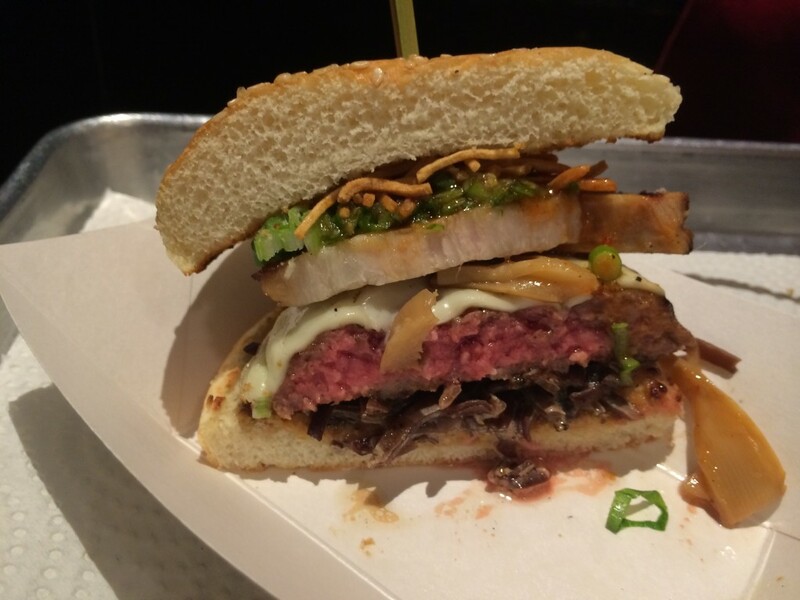 Keizo’s Burger, or as he called it the night of the event, “The Red Shack,” was a true culinary adventure. Normally I would look at a Burger with so many toppings and have a tendency to scoff. Once it becomes a 5 course meal between Buns, is it truly even a Burger? The answer doesn’t matter because it was AMAZING. 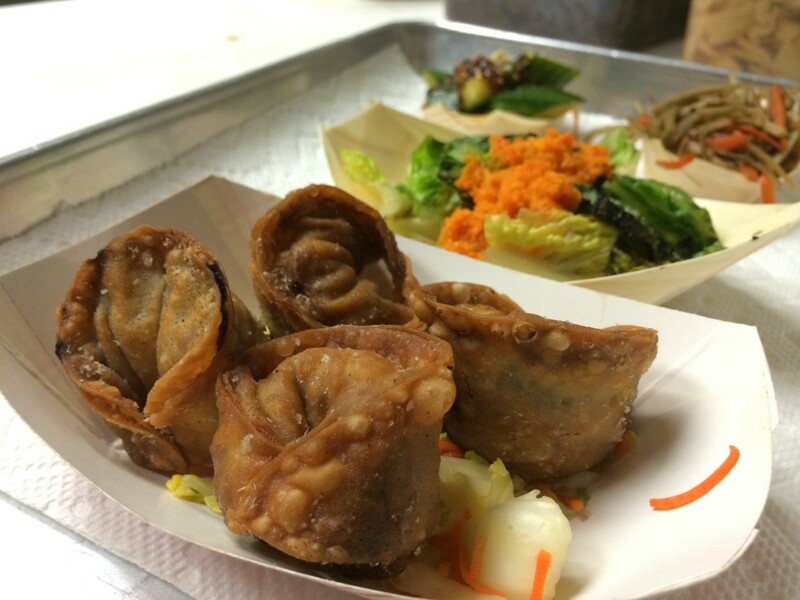 Every flavor complimented each other perfectly while paying tribute to both Eastern and Western flavors. All of it accented the fresh Certified Angus Beef Steakburger from Burger Maker which even at a 4 oz size, was cooked to a perfect medium rare. 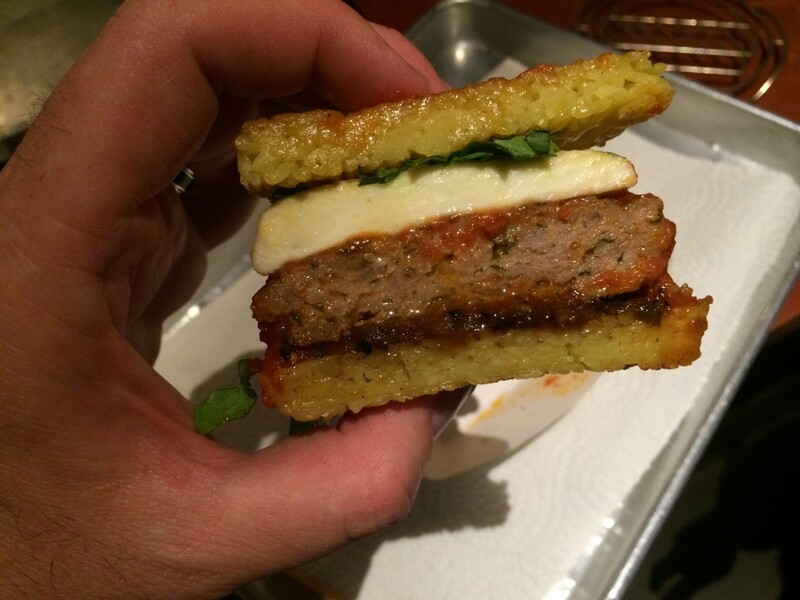 Jeff’s – Ramen Spaghetti and Meatball Burger with Sunday Gravy, handmade Mozzarella, Basil and Caramelized Onions. Jeff knocked this one out of the stadium. Again, not much of a surprise to me seeing as he did the same thing at the 67 Burger Off-Menu Burger Brunch for the 2013 NY Burger Week. 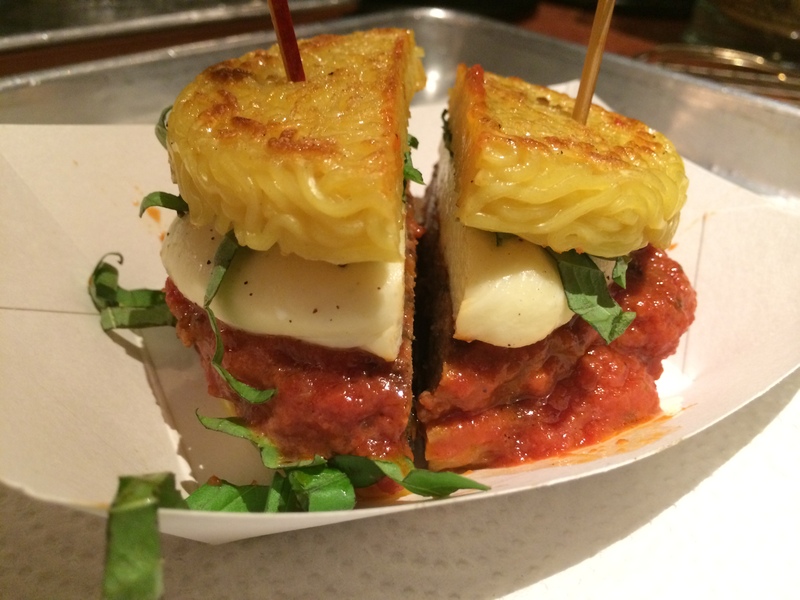 The Ramen Spaghetti and Meatball Burger was just mouth defying. Using Keizo’s signature fresh Ramen Buns, Jeff basically took the dinner that was served in my family’s house every Sunday night and made it into a Burger. All the flavors in this were very pronounced and every bite, much like Keizo’s Red Shack, was a total flavor bomb. As one of the attendees pointed out that night, Jeff definitely earned some Paisano stripes with this one! 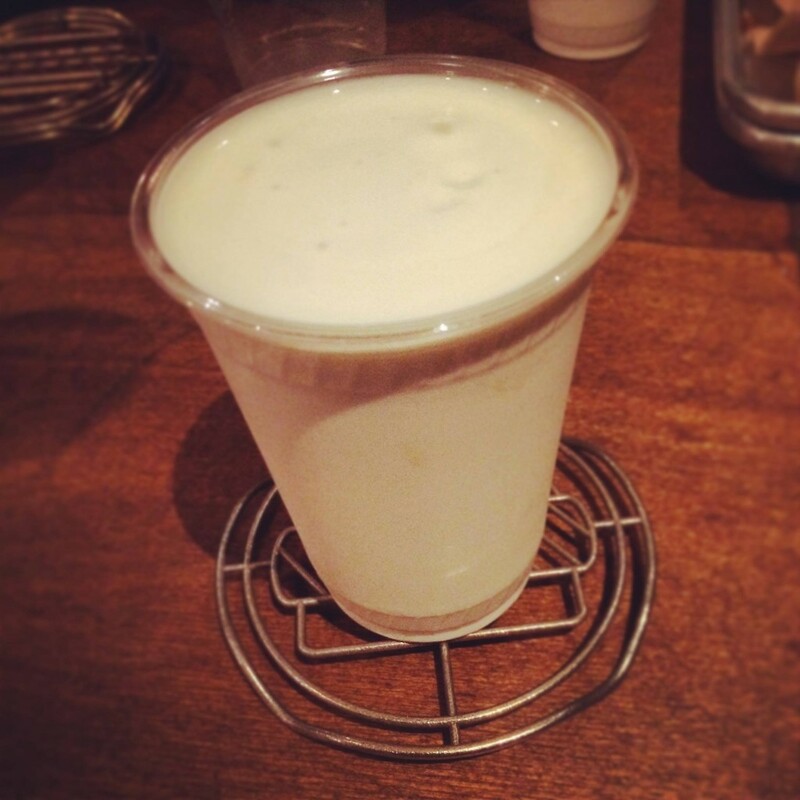 Photo courtesy of Burger Lift which is the name of the device underneath the Shake. 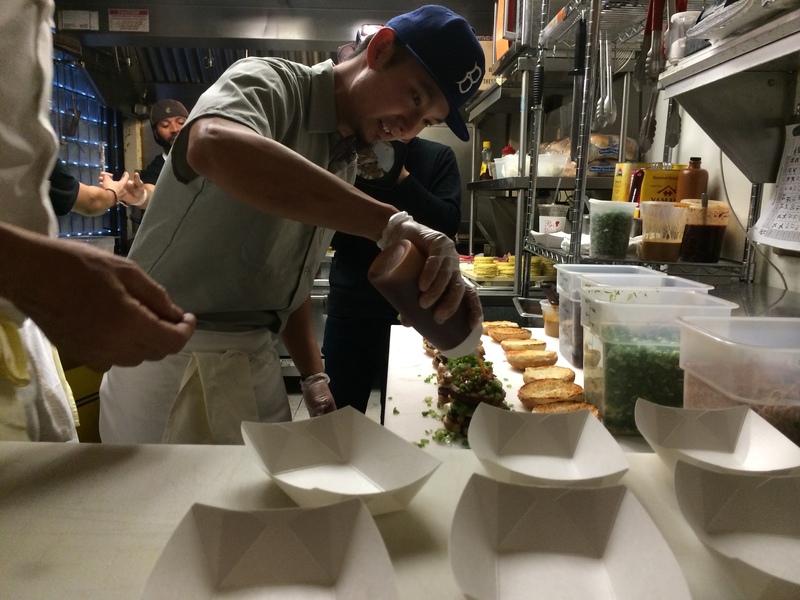 This event wasn’t about Burgers, this was Keizo’s and Jeff’s love letter to Food. Thank you to everyone who attended and went on this culinary adventure with me. 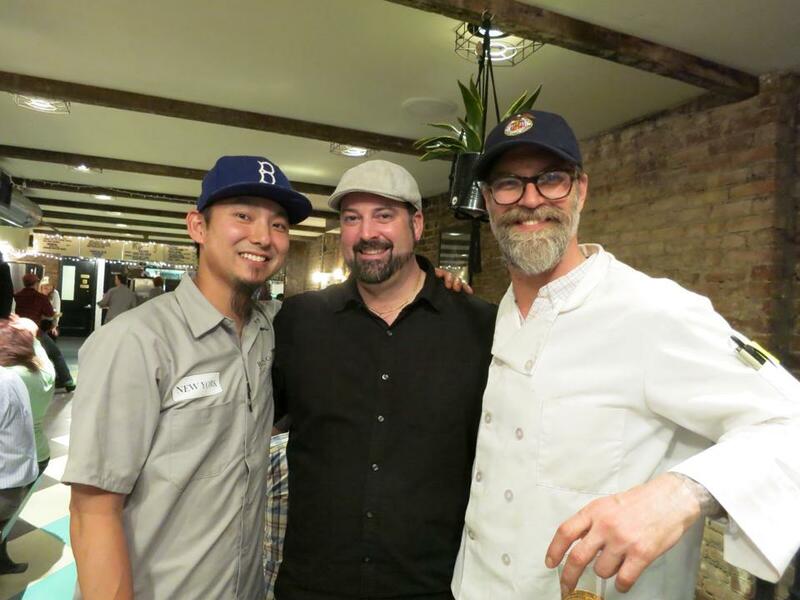 I hope you had as much fun as I did, immensely enjoyed the incredible Food prepared by Jeff and Keizo. 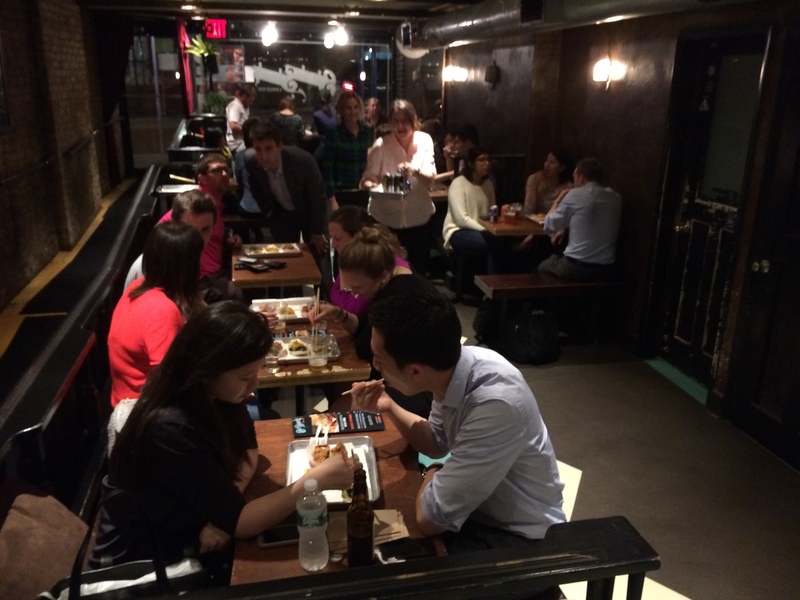 To Jeff, Keizo, Ed, Daphne, Junko and especially the staff of Black Shack Burger, you are awesome. 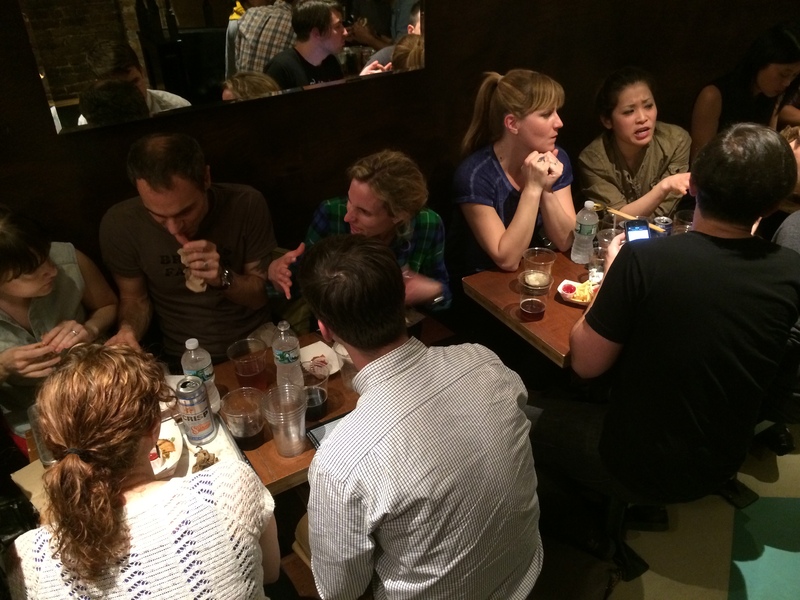 That was a very difficult event to pull off, with a lot of crazy parts, and all coming out of a very small kitchen. You crushed it. It’s a true honor to work with all of you. 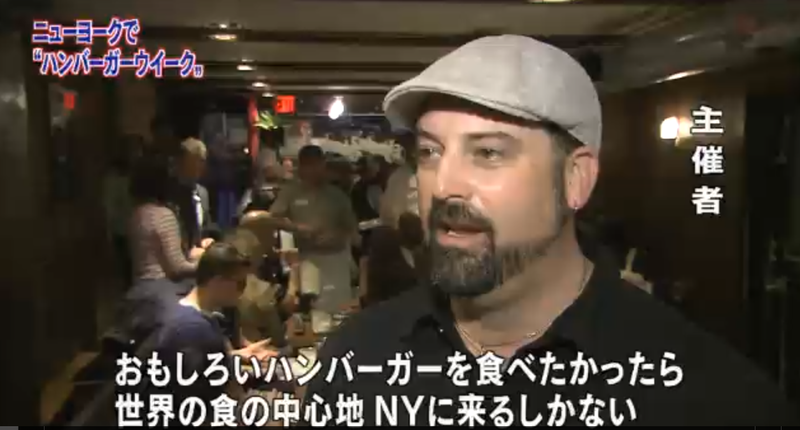 I can’t believe the NY Burger Week made it onto Japanese Television. 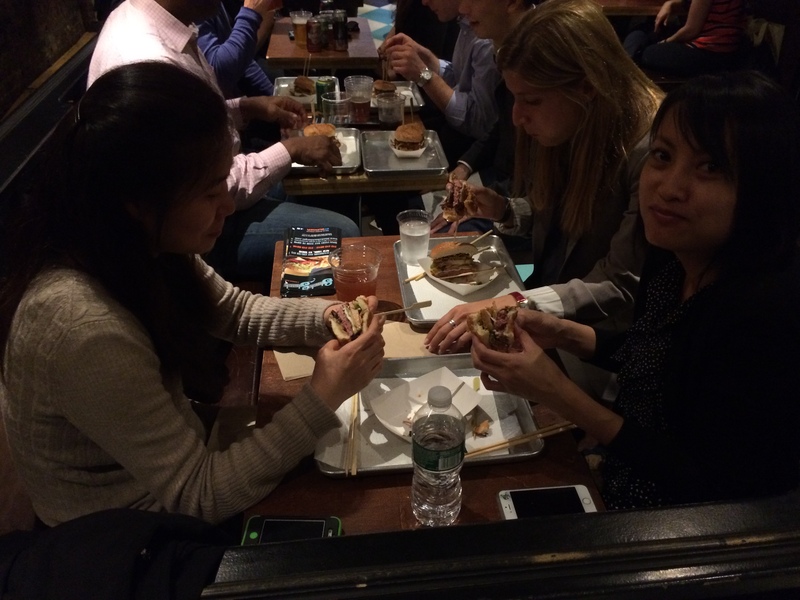 Thank you to the friendly and excited staff of NHK for supporting our Burgeriffic habits. Click here to see the news piece. 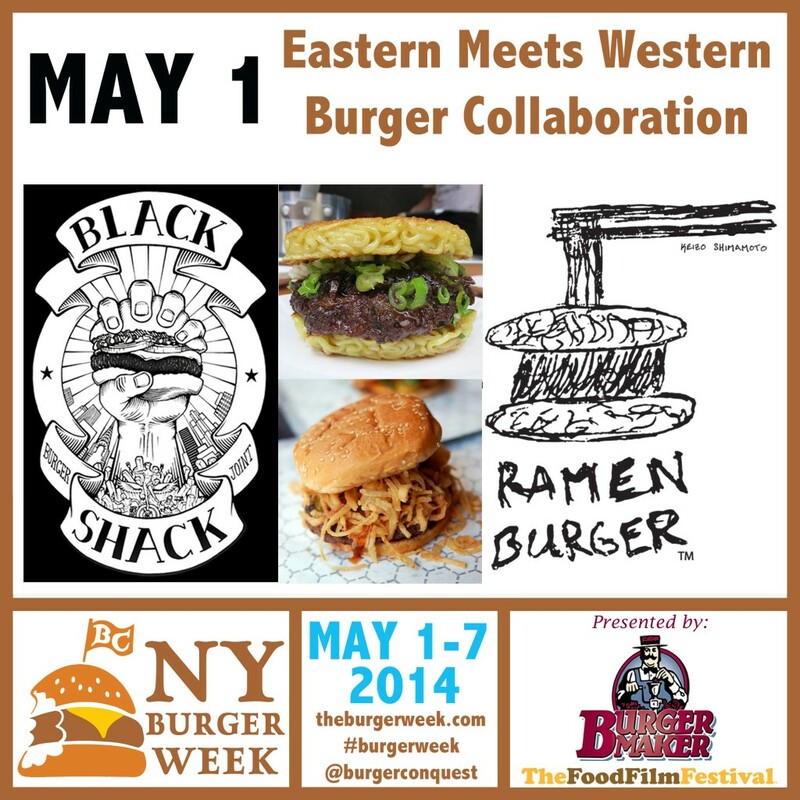 This entry was posted in Burger Week, Burgers, Event, Gourmet Burgers, Hamburgers, National Hamburger Month, New York, NY Burger Week and tagged Bar, Beer, best burger, Black Shack, boozy milkshake, breweries, burger, burger maker, ciancio, craft beer, david, events, Festival, food festival, food film festival, gourmet burger, happy hour, jeff maslanka, keizo shimamoto, ny burger week, nyc, off-menu, pairing, party, ramen burger, reservations, restaurant, rev, spaghetti ramen burger, the burger week. Bookmark the permalink.